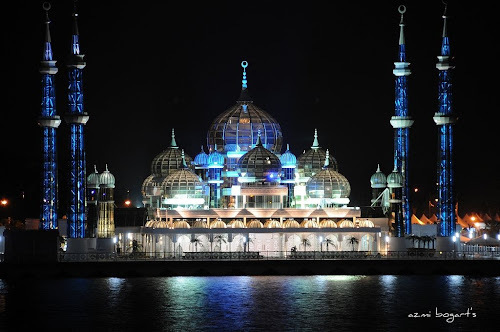 The Crystal Mosque (Masjid Kristal) is a magnificent mosque in the Islamic Heritage Park on a small man-made island of Wan Man, Kuala Terengganu, in the Sultanate of Terengganu - a constitutive state of federal Malaysia. The mosque including its dome and minarets are built entirely from steel and glass, giving it a stunning crystal look, hence the name. 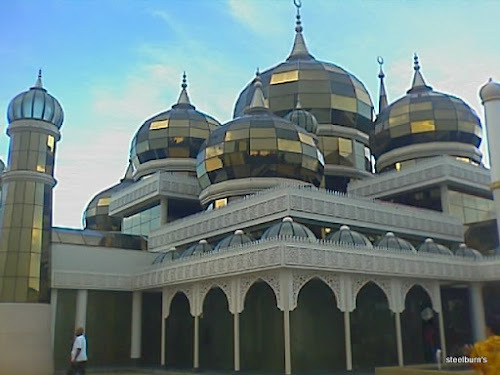 The mosque took about two years to build and was officially opened in February 2008. 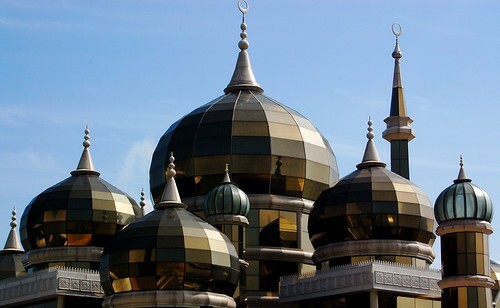 It is reportedly the only mosque in the World which is made entirely of glass and steel. The mosque looks grey during the day but due to reflection of sunlight some portions of the dome and minarets get a golden tinge. During night the dome and the minarets of the mosque are illuminated from inside with coloured (blue, green, yellow and pink) lights which keep on changing colours, giving it a colourfully exquisite view. The mosque is considered as one of the most beautiful mosques in the World. The main dome of the mosque is fitted with huge glass chandelier and the windows/doors made of frosted glass are decorated with beautifully etched calligraphy. About 1500 persons can offer prayers in the mosque, of which about 700 persons can be accommodated in the main hall. 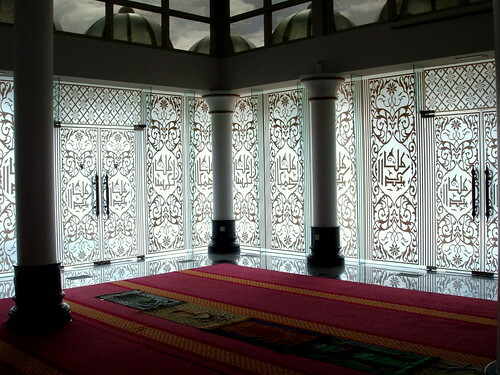 The mosque is fully air-conditioned and is provided with Wi-Fi, something unique for a mosque. 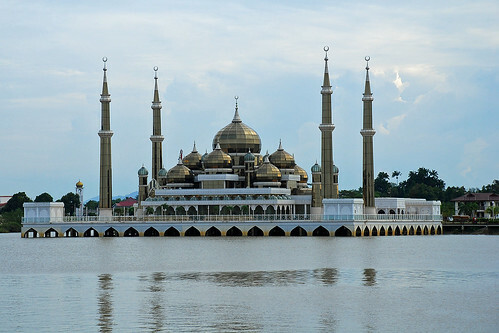 Besides Crystal Mosque, the complex also includes a Monument Park (showcasing miniature replicas of famous mosques and other Islamic buildings from around the World), Convention Centre, Guest House (called Crystal Villa) for tourists, Food Court (Indoor as well as outdoor), Water Garden and River Cruise. It is reportedly first Islamic Themed Park mixing religion with tourism and is one of the most popular tourist attractions in Malaysia.